DA leader Mmusi Maimane was accosted by Zambian officials who boarded his flight after it landed at Lusaka’s Kenneth Kaunda airport and told him he was being denied entry to Zambia. By PETER FABRICIUS. The South African government is to call in the Zambian High Commissioner to demand an explanation for why his government prevented DA leader Mmusi Maimane from entering Zambia on Thursday evening. “We intend calling in the Zambian High Commissioner to come and explain this whole thing to us,” Clayson Monyela, spokesperson for the Department of International Relations, said on Thursday night. He confirmed that this would be a “démarche”, the strong form of diplomatic protest which the DA had demanded. Monyela also said that an official from the SA High Commission in Lusaka had been at the airport to receive Maimane but had been unable to help him. Maimane said on Thursday night from OR Tambo International Airport on his return that the whole incident was “madness” and that he had been subjected to “apartheid-era” treatment at Lusaka’s Kenneth Kaunda airport. He had arrived on a flight to observe the controversial treason trial of opposition leader Hakainde Hichilema which is due to start on Friday. The DA leader said first immigration officials boarded the SA Airlink flight and told him he was being denied entry to Zambia. “No reasons were given,” he told Daily Maverick. Maimane said the Zambian authorities – by then reinforced by police – then forced his head down and demanded he unlock the phone, which he still refused to do. They eventually gave the phone and other equipment to the pilot. The Zambian authorities kept him and his two colleagues on the aircraft while they loaded the outward-bound passengers and then flew them straight back to Johannesburg. They got the phone and other equipment from the pilot there. DA national spokesperson Phumzile van Damme said Thursday night that Maimane had arrived in Lusaka on Africa Day to attend Hichilema’s trial on Friday and to “show support to Mr Hichilema, who is being unduly persecuted by his government, and to show the DA’s commitment to a human-rights based foreign policy”. Hichilema is being charged with treason because he refused to order his convoy to give way to President Edgar Lungu’s convoy when it tried to overtake his on a country road recently. 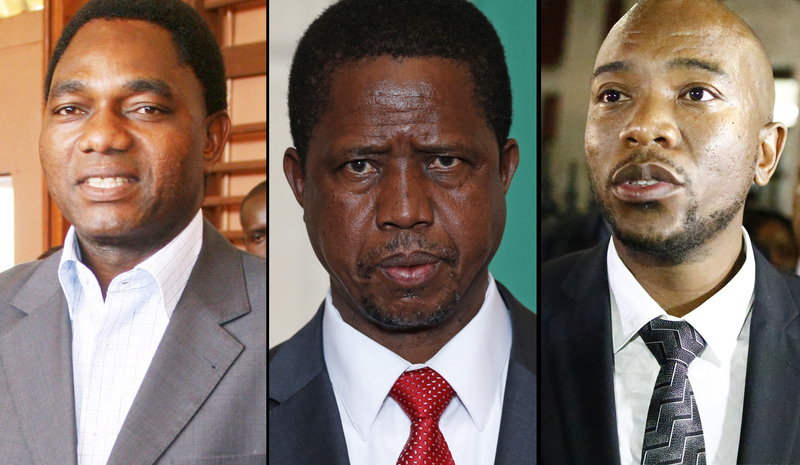 Zambian authorities have accused Hichilema of thereby endangering Lungu’s life. “Mr Maimane had strongly denounced the trumped-up charges against Hichilema, and had condemned the ANC government for not yet taking a stand against his treason charges,” Van Damme said. She said Zambian Police had “ aggressively confronted Maimane” and had taken his phone. “The South Africa government has the right and the duty to issue a démarche, or diplomatic order, and we expect that they will do so. “It is a deeply shameful day for the Republic of Zambia, when a Leader of the Opposition from South Africa cannot pass freely into the country – especially on Africa Day. But we will not be deterred. Greg Mills, head of Johannesburg’s Brenthurst Foundation and an expert on Africa, said last night it had been brave and politically astute of Maimane to travel to Lusaka to support Hichilema and show democratic solidarity. “Zambian authorities should simply have let him get off the plane and complete his visit,” he added. Mills said the Zambians had started something they could not control by charging Hichilema. They would be unable to convict him on the treason charge but they were too proud to drop the charges. Responding to Maimane’s demand that the South African government should condemn Zambia’s action, Mills said Pretoria would have to decide if it supported democracy or authoritarianism.